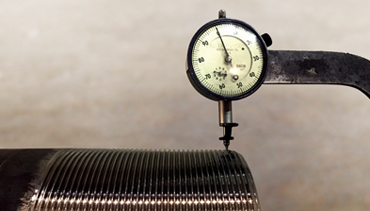 We perform a clean and re-dope while verifying threads are within API tolerance using profile and rotary thread gauges. A clean and re-dope consists of removing thread protectors, cleaning thread compound from both the tube threads and thread protectors, and then reapplying customer-specified thread compound and cleaned thread protectors. Full-length inner diameter (ID) drift is where a precision-machined drift mandrel is pulled through the full length of a tube. Full-length outer diameter (OD) drift is where a precision-machined drift band is pulled on the outside of a tube the full length of the joint. ID and OD drift services are used to verify dimensional uniformity and tolerance of a tube. Tubulars with discontinuities on the ID surface may potentially be removed by spot grinding. This is accomplished by grinding the ID surface while an ASNT Level II inspector monitors the remaining wall thickness, ensuring it does not drop below API specification. This service can restore a tubular with ID flaw to prime condition. We developed this program specifically to prepare tubulars for rig service, e.g., preparing a tubular that has been in storage. It consists of a visual thread inspection, full-length drift, and clean and re-dope. We developed this service specifically for processing tubulars returning from the rig. It is our goal to minimize your unusable inventory by quickly restoring tubulars to a useable or sellable condition. This program consists of a visual thread inspection, visual condition check, full-length drift, silver nitrate test, and a clean and re-dope. This is where a tubular is measured from end to end (or pin-end shoulder to box-end shoulder) to establish/verify length. The section is typically measured in tenths of a foot instead of standard twelfths of a foot, i.e., inches. This is where tubulars are walked, rolled, and visually scanned for tong marks, slip marks, holes, or any other visually obvious damage. For this service, threads are visually checked for damage, pitting, etc., and a clean and re-dope is performed.